The Welcome Bonus at Moon Bingo is a 300% deposit match on the first £10 added to a new player’s account. That’s £30 free. Previously the offer was extended up to a maximum value of £100, which should be looked for as an occasional promotion. Note, however, that £5 deposits do not qualify for the 300% bonus. 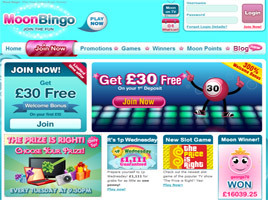 Licensed in Gibraltar, Moon Bingo went through a major re-launch in November 2009, disconnecting from the Dragonfish bingo network to offer its own standalone bingo platform. Since then, it has been offering both paid for and free Bingo, plus several popular online casino games, on a web site that is sleek and colourful in design. Secure gaming software provided by the Dragonfish division of Cassava Enterprises powers the site in a contract that runs through 2013. No download is required to play or wager. Moon Bingo’s primary language is English, and British Sterling is its currency. Plenty of 75 and 90 Ball Bingo Games are available at Moon Bingo. In fact, the action is non-stop, 24/7, complemented by lively chat rooms and a wide variety of side games, such as Slots, Blackjack, Scratch Cards, and more. The top prize at Moon Bingo can be found in the Self Made Millionaire Game, which has quickly become a favourite among regulars. It’s a 25p coverall that lasts just 5 minutes, with a jackpot of £1,000,000 up for grabs. Players may purchase from one to 96 cards, and a £1,000 jackpot is guaranteed. Moon Bingo also features a number of free bingo rooms with a prize pool worth up to £45,000 in free cash replenished every month. There are lots of affordable bingo games, with tickets priced at 1p, 5p and 10p, too. Players rave about the Chat Hosts at Moon Bingo, who keep the banter moving along, discussing everything from Bingo to love, life, and anything in-between. They have fanciful names like Dr. Love and Moon Fairy, but they are dedicated to their players and customer service, prepared to answer any questions or handle any situations that may arise. As an ongoing promotion, Moon Bingo provides its members with a 50% Re-Deposit Bonus for every deposit they make after the first one. This applies to the addition of funds in the £10-£100 range, worth £5-£50. No limit has been placed on the number of deposits that will qualify. Players can then use all that extra bonus cash to take advantage of a number of weekly promotions, such as “The Prize is Right” every Tuesday at 9.30pm GMT. This game gives participants the opportunity to win digital goodies worth up to £150, such as a Kindle, a camera, a DVD device, or a 20-inch flat screen. The cost of a ticket is as little as 5p. On Wednesdays from 4pm to 6pm a £1,111 Guaranteed Jackpot game is on offer and the buy-in is only 1p. Tickets may be purchased in advance for this popular event. And all day long on Wednesdays, anyone—including unfunded players—can play 1p games in the “Beginner's Luck” room. Those who share the fun of Moon Bingo by introducing friends can claim a bonus of £10 in free cash for each new member who joins. No limit has been placed on the number of friends who can be invited, and notifying them is as simple as clicking on the “Invite Your Friends” button on the web site. One other promotional feature of Moon Bingo is its Moon Points scheme. Players earn points as the purchase tickets, and the points can be accumulated for conversion into free bingo tickets and real cash prizes. The Account Page displays the member’s Moon Points balance and clicking on the “Redeem Moon Points” button is al that’s needed to convert them.